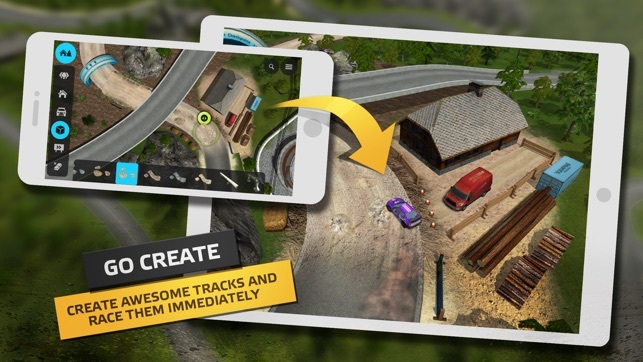 Draw a line on your screen, tap the ‘race’ icon, and instantly drive your very own track! Add hills, bridges, checkpoints, trackside banners, houses and terrain – create the circuit of your dreams, then share on-line and challenge your friends, and the world, to beat your times. Apple TV users can design on iPhone or iPad and then pick up the Siri Remote and play on the big screen! With player made tracks, there are potentially limitless possibilities. 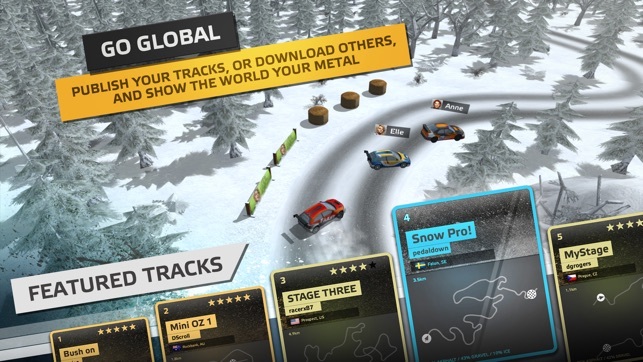 Pit yourself against a huge variety of pre-made rally tracks across stunningly realistic deserts, arctic snowscapes, forests and arid outback landscapes. Each course delivers a fresh challenge, from glass-like ice to treacherous rocks and everything in-between. The challenges never stop with new tracks being added all the time. CHALLENGE FRIENDS AND FAMILY AND THE WORLD! Rocket through each stage as fast as you dare and compete against friends, family and gamers all over the world to better your time. This is where rivalries are born! Career mode lets you work up the ranks from Rookie to Master. 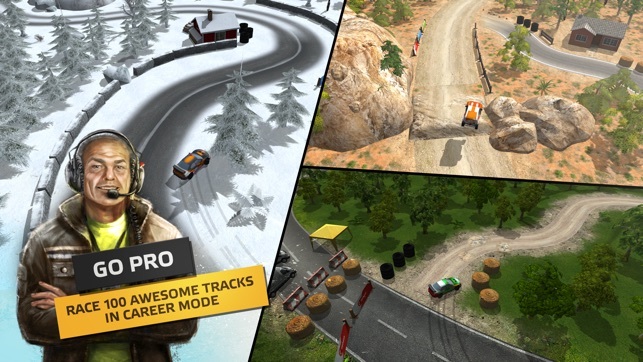 Work your way up through 100 tracks around the world and become the rally champion of the world. Only the most daring drivers need apply! 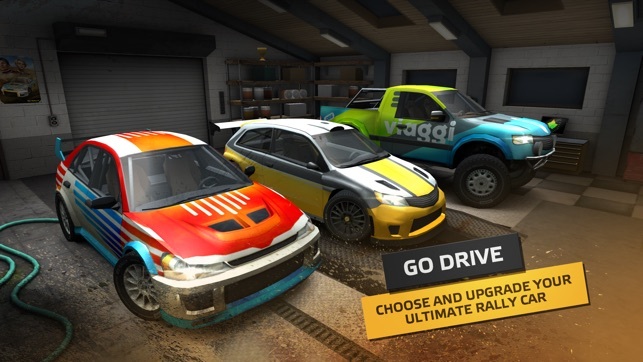 Choose from a cool collection of rally vehicles from ferocious muscle cars to powerful SUV’s. Customize with a stunning paint job so that no one will miss you roaring across the tracks. 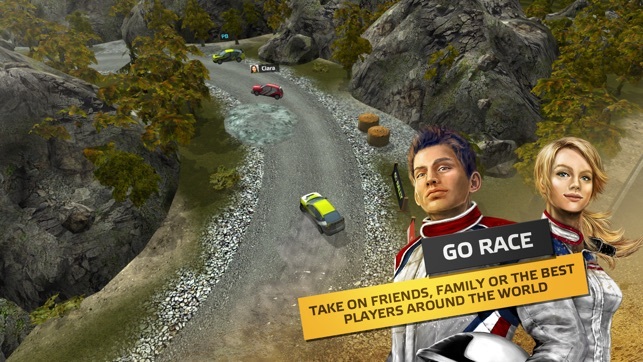 Go Rally plays brilliantly on Apple TV, from its pass-and-play gameplay and easy to pick up Siri Remote controls to its visuals that look great on the widest of widescreens, the game is perfect family entertainment. Visit https://help.ea.com/en-gb/go-rally/go-rally for assistance or inquiries. Игра получилась интересной благодаря редактору и публикаций карт, но хотелось бы внести больше предметов и самое главное это возможность в редакторе изменять вид камеры! Чтобы можно было покрутить вокруг и наклонять! Удобней редактировать. Ещё добавьте режим повтора после заезда)) чтобы можно с разных ракурсов посмотреть как ехал. Ручник добавить чтобы проходить крутые повороты и систему вознаграждений за прохождение трасс, ранее созданных в редакторе. И будет идеально.